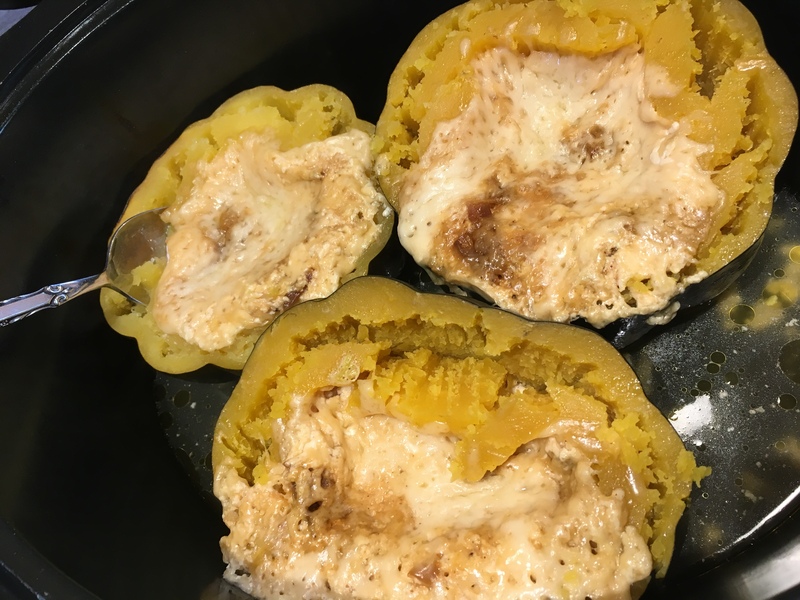 This recipe calls for roasting the squash, but I have also tried it in the crock pot (pictured) which works. Just cook on high for 3 hours. • Season the flesh-side of the Acorn Squash with Salt and Pepper. Slice a small piece off the bottom of the Squash so that they lay flat on a roasting pan with the flesh-side up. • Meanwhile, melt the Butter in a large sauté pan over medium-high heat. Add the Leeks and sauté until tender (about 4 minutes). Remove from heat and set aside. • In a medium bowl, stir together Mascarpone, Heavy Cream, Nutmeg, reserved Leeks, Salt and Pepper. Ladle the Cream-Leek Mixture into all the Squash Halves, filling them 3/4 of the way up. Sprinkle the top of each Squash with 1/4 cup of Gruyere. Cover with foil and bake for 1 hour or until tender. • Remove foil and broil for 2 minutes to brown the top.